Presented at the Detroit Auto show January 8, 2001. Looks like it took a back seat to the introduction of the production colors for the coming 2002 cars as little mention of this concept auto has been made in the magazines. I saw more activity on ebay over the press kits but when the press kits for the 2002 models started appearing, interest seemed to wane on this auto. Suspect that Ford would have had more interest in the Sports Roadster if the model had come out later in the year. After all, everyone was waiting for the production introductions. 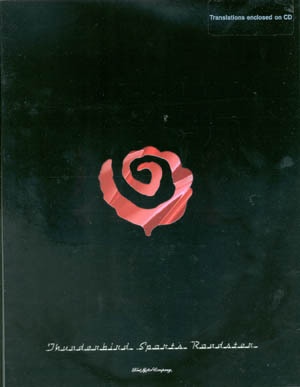 The press kits for this model are very striking - a black portfolio with a rose cutout that showcased the Red concept underneath. For more pictures, check the links pageand some of the magazines listed on the 2001 magazine page. From a viewers stand point, the only thing new on the Sports Roadster Concept is the molded tonneau covering the area behind the seats, making this car resemble the 62/63 Sport Roadster convertible. Really would like to see this tonneau cover available on the cars. I can envision the reduction of air movement between the bucket seats with this cover in place. Until I've been a passenger of this auto, won't be able to compare the wind problems. I will say this, though, having a Chrysler LeBaron convertible and also a Chrysler TC by Maserati, along with our "little 'bird" - the Chrysler LeBaron comes out tops for low wind in the front seats. The TC and the Little T-bird are about the same - heavy wind. It will be nice if the NEW Thunderbird follows the LeBaron or is even better. The added Tonneau cover should make it even more pleasant to ride around in. On my LeBaron, I have to lift the tape holder cover/armrest to reduce wind whipping around from behind the seats. The interior color must also be mentioned. The first year production cars all have black or 2-tone color and black. Either way, that is a HOT interior when you have the top down, particularly when you park it for any length of time in the sun. 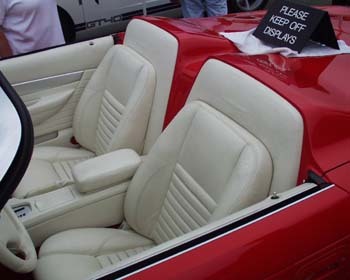 Be sure to wear long pants when you ride around in the 2002 car or take some towels along with you to lay on the seats as you will not be able to sit down on the seats while wearing shorts, after parking in the sun - talk about a major burn factor. That goes for your arms, too. Now, this sport roadster model has an ALL WHITE interior - my preference for comfort as that is not near as flesh searing as the black interior. A cloth seat is even better when it gets right down to it. 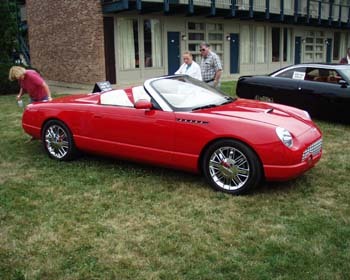 As an added note, the one magazine I've seen this model pictured in, had the car labeled as a "Modern Muscle"
Update on magazines: Motor Trend ran a survey and the Sport Roadster was voted the concept that voters most wanted to see on the road. Update - a radio control model became available in October 2001 - check the diecast page for more information. Update (2010) on my comment above about the hot seats. Rarely has this happened to us with this car. Unless parked at the wrong angle to the sun, we've rarely experienced hot seats due to the rake of the windshield and the height of the head rests shading the interior most of the time. We also found that just leaning the seats forward if the sun is hitting the seats, will eliminate hot seats. Another way is to just put the softtop up as it goes up in seconds - quicker than putting towels in place or other cover. Some trivia related to this car. Toby Keith had the use of this car in a Music Video he made in 2002 for his song "Whose Your Daddy". Update 2011 - Ford is putting the Sports Roadster Concept up for auction on August 19, 2011 during the Pebble Beach Concours in Monterey thru R&M Auctions. Proceeds will benefit the Juvenile Diabetes Research Foundation. 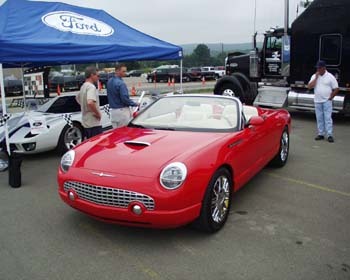 This info corroborates what was heard from the company that built the 3 concepts for Ford as it's a 1999 vin#'d chassis and the 2nd and 3rd concepts were built in a short period of time after the debut of the yellow Concept in Jan. 1999 and on the show road by March 1999. Update July 2014 - Whereabouts of the Thunderbird Sports Roadster have been found. It is also located in the Dallas, TX area along with the Supercharged show car. Both Concepts will be auctioned off on November 14/15, 2014 at Sam Pack's Classic Car Museum in Dallas, TX. Time has marched on and it's now 2010... and I'm still finding new information. Recently picked up a rare piece of Thunderbird history, from the hands of the board's designer. " 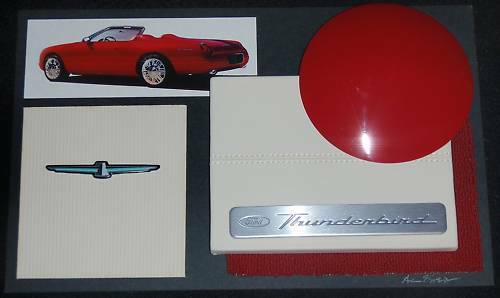 It's a color and material design display board used in the development of the 2001 Thunderbird Roadster concept car. It features fluted and stitched leather and carpet sample which are fastened to the board."[A.E.]. It was put together by senior color designer for the Ford Motor Company, Alan Eggly, who later went on to work at Saleen on the Ford GT and other Saleen projects as plant and paint manager.